Straight out of the box, and replete with that new helmet smell and unblemished look, the Arai XD-4 is one of the nicest dual sport helmets on the market. Claimed to have a new “rounder, smoother, & stronger shell”, I can attest to this being rounder and smoother than previous versions, although I would really like to hold off on reviewing the strength part for as long as possible. My first impressions, as I lifted the Arai XD-4 from the shipping carton, was the larger number of accessories that ship with such a helmet, including stickers, silicone lubricant, extra Arai stickers, instructions, alternative side shields (should you wish to remove the visor in favour of goggles), and a helmet bag. 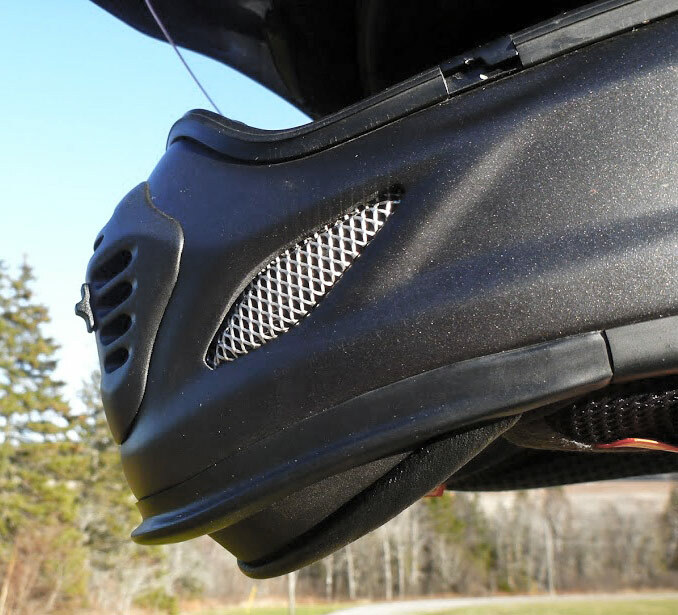 The fit out of the box was snug, notably more so than older versions of the XD lineup, but Arai has answered that with removable foam from the new cheek, brow & temple pads that come with scorings that allow you to rip off sections to adjust the fit. It’s a neat solution to accommodate all the head variations out there, though I found the lining worked in fairly quickly, and by the end of the season, I am very happy with the unmodified fit, so don’t remove the foam until you’ve given it some usage. The aerodynamics of the XD-4 are good, so shoulder checks, or watching birds fly overhead do not rip the helmet off your head, and I was very pleased to find that the helmet performs equally well in unspoiled air as it did behind my windscreen. The visor will vibrate a bit, which I found a bit distracting, but it performs well in cross winds, likely due to that “rounder, smoother shape”. If you are one of those who have a smaller windscreen, you will love how this helmet works. Chin bar is closer to the rider and comes with retractable shroud to keep wind off the neck. The visor stays where I put it (for now – ask me again in a few years), and is optically correct, complete with a friction lock to secure the visor in the closed position. Yes, you can remove the visor and wear goggles with the helmet, but I’d rather save those for my MX helmet, as the visor works well enough for me. I wear earplugs when I’ll be on a bike for more than a few hours, yet I felt that the XD-4 was relatively quiet, and when I did forget to put in my earplugs, the wind noise didn’t stand out as unbearable or excessive. This may be thanks to the chin bar, which is more like that of a street helmet in terms of how far away from your mouth, reducing the opening at the bottom. The XD4 also comes with a built-in “chin spoiler” that does help keep your chin warm on cooler days, but it also serves to limit your ability to quickly take a sip from your camelbak, or to pop a mint while riding. A minor niggle I know, but I could live without the feature. Another thing common to many Arai helmets are the number of vents offered to the rider, and the XD incorporates brow vents, four top vents, a mouth vent, and two chin vents. When it is exposed to unspoiled air, it flows through those vents brilliantly — better than most other helmets I’ve worn — but if I was behind a screen, I was more comfortable with the visor cracked open, though this then renders the brow vents inoperable. Riding in the rain and fog is a different matter, as despite all the ventilation, I found I had to ride with the visor cracked open to flow enough air to keep it clear. This also allowed some water to seep in down the interior of the shield and soak into the liner, yet the Arai fabric worked very nicely when wet, and I had no issues after a few hours in the rain with any discomfort. If I can sort out that fogging issue for cold & wet weather riding, I’d recommend this as a first class helmet for touring, adventure riding, and maybe the odd bit of trails bashing too. Arai does offer a pin lock system which might be just what the doctor ordered to fix the only flaw I found with this helmet. As a quick comparison test, I rode a few days with an older DS helmet, and couldn’t wait to get the Arai back onto my head, it is so comfortable. But that does come at a price. At an MSRP of C$719.00 – C$869.00 (depending on graphics) it’s on the high side but similarly priced to the Icon Variant and Shoei Hornet X2 adventure helmets. I measure 23.5″ which puts me in a large for this helmet. I wear glasses also and am thinking of going with an XL for a little bit more room. Any thoughts on this? After riding with this helmet for three seasons now, my best advice is to get the optional pin lock visor for the helmet, as this helmet fogs up easily and can be dangerous in foggy or rain conditions. As a long time Arai owner, I picked up one of the XD3s during one of my frequent splurges at Aerostich in Duluth. 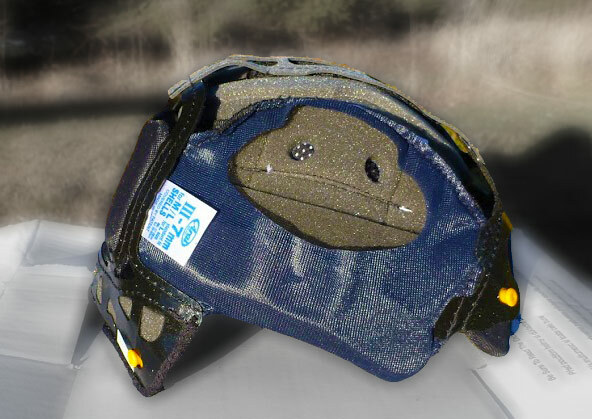 I find it fits great and is quiet, but the liner is very rough on my bald head, the shield doesn’t raise high enough when open, the tab of fabric under the strap isn’t long enough and I agree, it does fog up easily, perhaps because of the low shield being near my nose and mouth. I would have hoped these issues would have been addressed in the XD4 version, including an included pinlock like HJC and Nolan do, but I guess not.